This post may contain affiliate links, but all opinions are always my own. Thank you for helping my family. It seems with all my chatter about reading 52 books this year, people are talking. Multiple people have asked me how I find the time to read. They see that I have 6 kids, I homeschool, and I have a home business. How on earth would I find any time to READ? Here is the thing…I make it a PRIORITY. I thoroughly enjoy reading. I have seen the benefits reading brings to my life and I love passing that on to my children. John C. Maxwell says, “To change your life, you need to change your priorities.” I believe personal growth is too important to to overlook. I am the only one responsible for my growth, either my lack or my gain. So, reading is a priority for me. I am often in a couple different books at once and read them at different times, depending on what I need. In the morning, after I do my Bible reading, I spend about 15 minutes reading a spiritually encouraging book and then another 15 minutes reading a personal development book. This is usually more business/leadership based. Right now, I am reading The Circle Maker and People Follow You. You’ll notice this gives me about 45 minutes of reading time in the morning. That is a big chunk of time. Yes, I do get up early in order to do this, but again…it is a priority for me. Some days my children wake up earlier than I would like, but then they know to just curl up and read with me. They will repeat what they see my modeling for them. For me, daytime can be harder to find time to read. We homeschool, so I am technically reading all day long to my children. 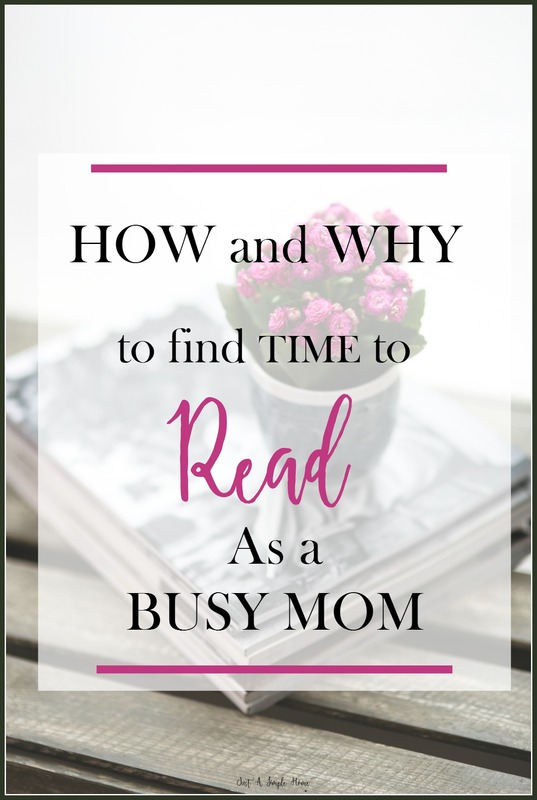 I try to get a few minutes of personal reading done here and there…it may be while the kids eat lunch or it may be while I am putting my littlest to sleep. This only tends to be a few minutes though, as naptime is normally my work time. Luckily, I am a fast reader so I often still sneak in a chapter or so. The other way I can get in some reading is in the car. If we are in the car waiting to pick up someone from an activity, that is a perfect time to read. I actually keep a book in the car at all times and it has come in really handy! I am not a night person. Perhaps I will be someday, when my babies are older, but not right now. After dinner and chores, I tend to shut down a bit. My brain just doesn’t work very well. I have found that this time is the perfect time for me to get some good reading in. I read a book that doesn’t involve a lot of thinking on my part at night. This is usually another personal development type of book, but it’s more encouraging than thought provoking. This may also be the time I read a fiction book, although they are few and far between. Right now, I’m reading Leading Women to the Heart of God and it’s so good. Reading during the time between chores and bed has also helped me get in the right mind frame to read to my children before they go to bed. It’s a win-win all around. As you can see, despite my busy schedule…I find the time to read! When people tell me that they don’t have time to read, I disagree. It’s just that you need to decide it is a priority for you. If it isn’t, that is ok too! We all go through different seasons of life. For me, because reading is a priority, I choose to find pockets of time to include it as part of my routine and it has become a habit. If you are looking for some help with time management, you may enjoy this post I wrote recently on Productivity Habits to Simplify Your Life. You may find you have more time than you thought! Thank you for this! I have been reading like crazy lately trying to compile lists of great books for my kids to read over the summer. Although it has been awhile since I have read more than just children’s books, I have found my love for reading rekindled. I am curious if you have a book list or are on Goodreads by chance. With 52 books in a year, there are bound to be some fabulous books on your list! Reading is my absolute favorite thing to do, but it has definitely fallen by the wayside since becoming a mom. But your post also makes me realize that it is important for my daughter to see how much joy I take in reading, so that she will love it, as well!